March 29 is my dad’s birthday. This year he will be 79. I’m sure when he came into this world, and as the beginning days of his life unfolded, had he looked ahead, he would not have imagined where his journey would take him – the good and the bad. I would not have imagined the shifting shape of it either. I didn’t meet my dad when I was born. It was some weeks or months later when he came into my life – or I came into his. And then, for him, it was love at first sight. Maybe for me too but I don’t remember. What I became aware of later is the connection I’ve always had with my dad. He was not always an easy man to live with. There was a lot of tension in my house growing up and even after I left. He and mom had their share of battles and I had some of my own with him, though few. Having said that, people were always welcome in our home – from the earliest days of my memory. No one was ever turned away – visitors, from near or far. My friends from school came to play and often stayed for supper. Always room for more. It fostered a sense of hospitality in me that only grew over the years. That, and friends could be like family – experienced over and over again during Christmas holidays in particular for quite a few years as a large group of friends gathered for a traditional Gaspe meal after midnight on Christmas Eve. The sea has always been in my dad’s blood. 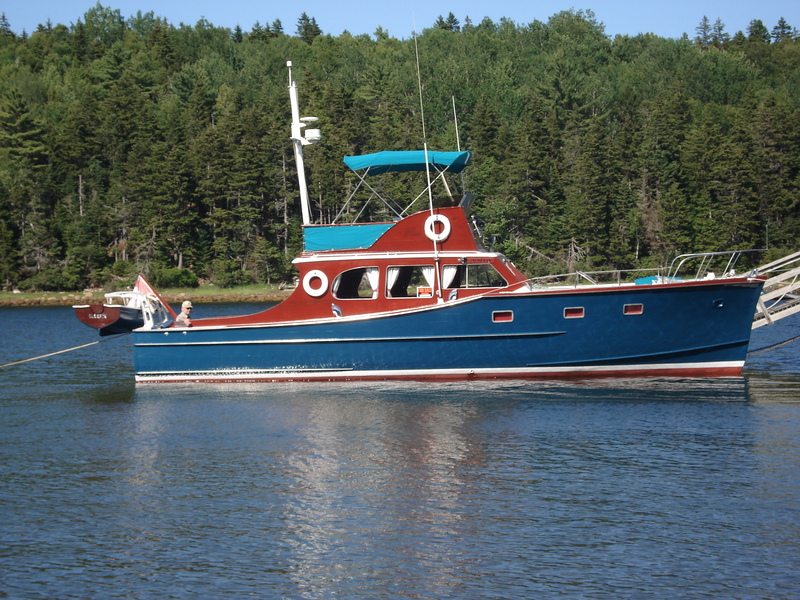 He has owned a few boats over the years but his pride and joy was a beautiful wooden boat, the Bluefin, which he owned for thirty years. With care and craftsmanship, he rebuilt that boat from stem to stern over the time he owned it. If that boat could talk, many a story would it have to tell. I already lived in Halifax when the Bluefin came to dad. 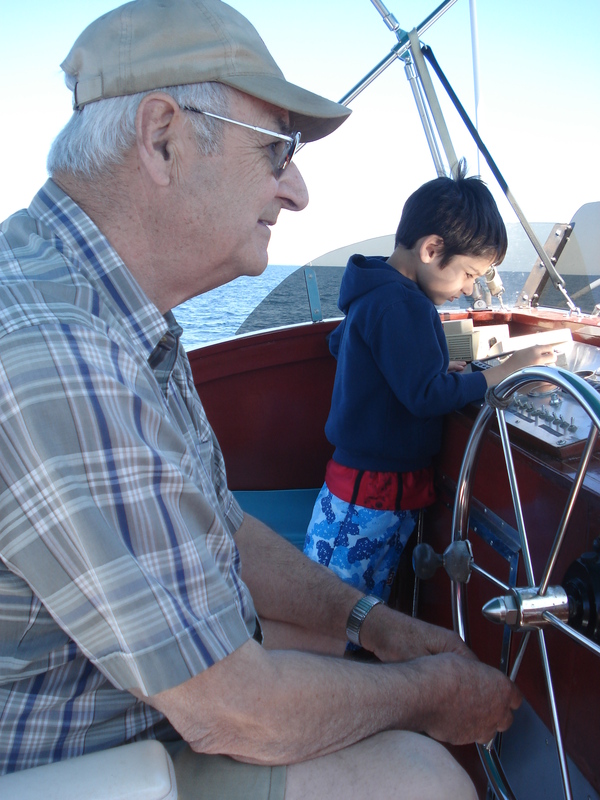 He and my mom always enjoyed having guests aboard – and that remained true to the final summers we went out on it. In the early years, it was much more of a party boat. I and my friends were always welcome. Most of the time, anyway. Then there was one spring when we offered to help him paint the inside of the boat to get it ready for summer launch. It all started off well enough… until the beer came out. And then… well, let’s just say dad found yellow paint in places it wasn’t supposed to be for years afterwards. I still can’t figure out why he never really responded to future offers of assistance! When his first grandchild came along, he beamed. It was probably the only time he stopped by the house unexpectedly on his way to and from the airport. It was an unexpected delight – maybe for him too. No questions asked, he and my mom helped me move. No judgement – not to me anyway. A lot of love and caring. I saw that love and caring demonstrated over and over again in obvious and less obvious ways. In particular, I saw the love and caring my dad demonstrated towards my mother in the final decade or more of their marriage – more and more consistently than I had seen it at any other time. If someone would have asked me years ago (and maybe they did), I would have imagined that my father would have died comparatively early in life (he did have his first triple bi-pass surgery when he was 45 – thankfully his health status leading up to that also triggered his decision to stop smoking) and my mother would still be living in the full vibrancy of who she was well into her 90s. Instead, it was a different path that unfolded. My mother was diagnosed with breast cancer in 20o1, again in 2005. Somewhere in that period of time was the onset of dementia that ultimately took her into long term care in 2008 until her death a few weeks ago. My father became my mother’s care giver. At first it was in little ways. Noticing the little things that were not quite right. There were a few conversations about my mother forgetting this or that… like forgetting to turn off the oven, or turn on the washer. Then it became more obvious, like mom put the banana bread in the oven, went to take it out five minutes later and couldn’t understand why it wasn’t cooked. This eventually evolved into my father watching out for my mother 24 hours a day. He watched over her day in and day out, night in and night out – including taking care of her hygiene – at home and sometimes in public places. When my mother died, my parents had been married for 54 years. On their 50th wedding anniversary in January of 2008, my brother and I had planned a celebration for them. We had hoped for a big celebration. It ended up being a small celebration in their home. I spoke a few words. I had already planned to speak about the two things I felt I integrated into my life from my experience with my parents – that sense of hospitality or everyone being welcome and unconditional love and support. This took on whole new layers of meaning in the week before the 50th anniversary when I learned that I had been adopted and had never known or suspected it at all. The feelings of unconditional love and acceptance were magnified as that story unfolded and I had a conversation with my father about aspects of my life I had known nothing about. As the story emerged, I was asked if I was angry. I pondered the question and then responded, “If I looked at this from the perspective of people have been lying to me all my life, maybe I would be angry. But I look at it from the perspective that people made the best choices they knew how to make. They wanted to do the right thing and choices were made out of love. My father is a man who wants to do the right thing. This was most evident in the latter years of his marriage to my mother. He loved my mother. He wanted to do well by her. He exhausted himself as he watched over her, tended her and took care of her until the very last minute when we admitted her into long term care. Then, every day, he went to visit her for over a year. It was hard for him seeing mom in her diminishing world while he still lived in the house that had been their home for over 3o years. There are many stories in this man’s life. I only know some of them. They are not all pretty but they are all representative of a man who has lived a complexity he might never have imagined, who has given a lot, cares about craftsmanship and doing things well. He has traveled many roads and still has a few to go. Dad is in hospital, yet again, as I write this. This too has been a pattern of our relationship over the last decade. He has an amazing will to live and is incredibly resilient despite health problems that have been challenging him over the years. We live into and learn together – through thick and thin. I wish him a happy 79th birthday knowing he would be much happier if he was home for it. I also wish there will be many more for him with a quality of life that allows him to pursue, in ever more gentle ways, the things he loves to do and do well. This entry was posted in Spiritual journey, Stories and tagged dementia, Kathy Jourdain, life journey, love, Shape Shift Strategies Inc., shifting shape by Kathy Jourdain. Bookmark the permalink. Your father is a wonderful soul and you are a reflection of his awesomeness. thank you for the tribute. Thank you for writing and sharing this beautiful tribute, Kathy. I also had the privilege of watching my 90+ dad very tenderly care for mom as dementia took more and more of her. So many lessons. It is a crazy world we live in with lots of opportunity to see beautiful and unexpected behaviour. Appreciating the many qualities of life, relationship and people.